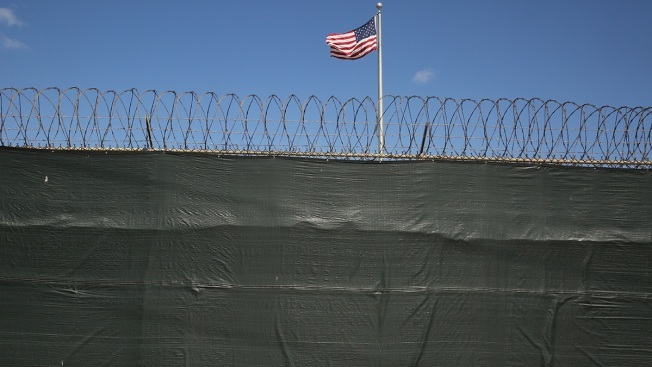 FILE - In this Feb. 2, 2016 photo, a flag waves inside Camp 6 at Guantanamo Bay, Cuba. President Donald Trump's sudden announcement that he was pulling the U.S. military out of Syria came with no plan in place for what to do about more than 790 imprisoned ISIS fighters and their families. Now his administration is in a frantic search for solutions, including a renewed look at sending the most dangerous fighters to Guantanamo Bay, U.S. and congressional officials tell NBC News. Amid the tumult, U.S. diplomats and military officials have been making urgent appeals to foreign countries to take back foreign fighters who went to fight in Syria and were apprehended, so they can be imprisoned and prosecuted in their home countries. It's an appeal the U.S. has been making for several years in anticipation of an eventual U.S. withdrawal, but nearly every country has refused.